Made in USA, Texas. This item was carefully made by hand, made of high quality Genuine real leather in the united states. let the natural feeling of Genuine leather describe it self; smooth touch, nice smell, long lasting each step of making this leather item is hand made so we pay attention to all details , we buy the highest quality vegetable tanned leather locally and we dye it with our special and distinguished colors that can't be found any where else, you can enjoy choose one of our colors collection, or you can adjust an available color according to your desire or even choose a new color, we'll be more than happy to work it out. Specifications: 8 credit cards slots and one cash bill slot. can hold up to 16 cards. height 3 4/8" ( 9 cm ) width 4 4/8" ( 11.2 cm ) If you like to personalize your item, choose an option on the top right of the page and follow instructions. it's uniquely made for you, non will be the same because by hand made it's almost impossible to match 2 pieces. we're not using any enhanced pictures, we use a regular cell phone camera, so what you see is what you get. colors might be a little bit different because of hand coloring and different light changing on camera. 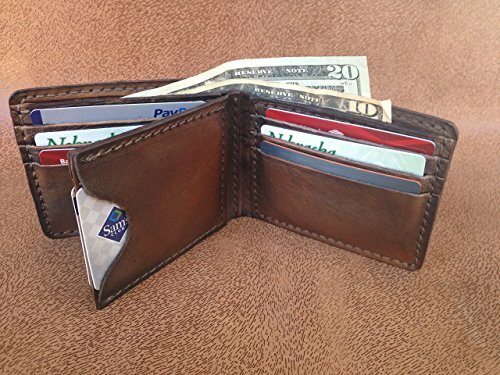 this wallet will last long and never get old, genuine leather get better by time. If you have any questions about this product by sycadaleather, contact us by completing and submitting the form below. If you are looking for a specif part number, please include it with your message.